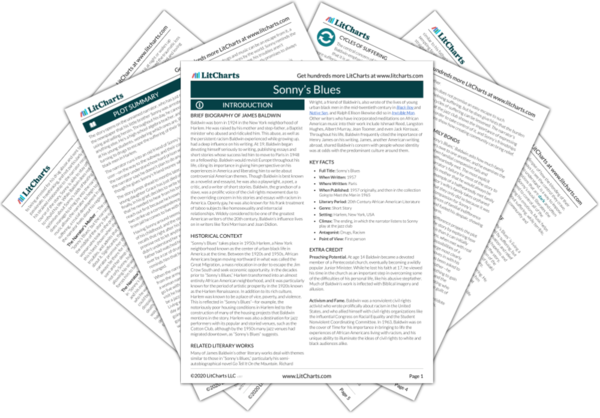 Instant downloads of all 942 LitChart PDFs (including Sonny’s Blues). Welcome to the LitCharts study guide on James Baldwin's Sonny’s Blues. Created by the original team behind SparkNotes, LitCharts are the world's best literature guides. A concise biography of James Baldwin plus historical and literary context for Sonny’s Blues. A quick-reference summary: Sonny’s Blues on a single page. In-depth summary and analysis of every of Sonny’s Blues. Visual theme-tracking, too. Explanations, analysis, and visualizations of Sonny’s Blues's themes. 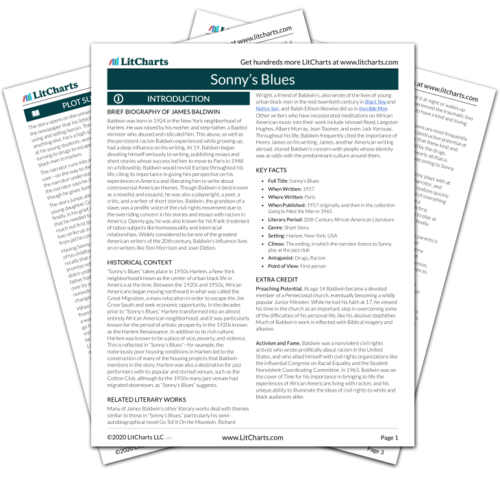 Sonny’s Blues's important quotes, sortable by theme, character, or . Description, analysis, and timelines for Sonny’s Blues's characters. Explanations of Sonny’s Blues's symbols, and tracking of where they appear. An interactive data visualization of Sonny’s Blues's plot and themes. Baldwin was born in 1924 in the New York neighborhood of Harlem. He was raised by his mother and step-father, a Baptist minister who abused and ridiculed him. This abuse, as well as the persistent racism Baldwin experienced while growing up, had a deep influence on his writing. At 19, Baldwin began devoting himself seriously to writing, publishing essays and short stories whose success led him to move to Paris in 1948 on a fellowship. Baldwin would revisit Europe throughout his life, citing its importance in giving him perspective on his experiences in America and liberating him to write about controversial American themes. Though Baldwin is best known as a novelist and essayist, he was also a playwright, a poet, a critic, and a writer of short stories. Baldwin, the grandson of a slave, was a prolific voice of the civil rights movement due to the overriding concern in his stories and essays with racism in America. Openly gay, he was also known for his frank treatment of taboo subjects like homosexuality and interracial relationships. Widely considered to be one of the greatest American writers of the 20th century, Baldwin’s influence lives on in writers like Toni Morrison and Joan Didion. 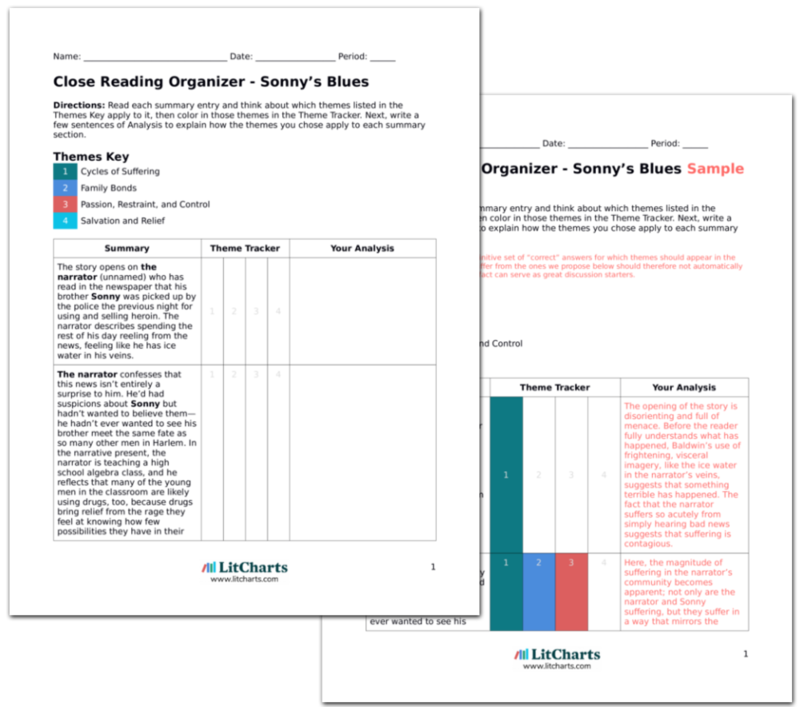 Get the entire Sonny’s Blues LitChart as a printable PDF. “Sonny’s Blues” takes place in 1950s Harlem, a New York neighborhood known as the center of urban black life in America at the time. Between the 1920s and 1950s, African Americans began moving northward in what was called the Great Migration, a mass relocation in order to escape the Jim Crow South and seek economic opportunity. In the decades prior to “Sonny’s Blues,” Harlem transformed into an almost entirely African American neighborhood, and it was particularly known for the period of artistic prosperity in the 1920s known as the Harlem Renaissance. In addition to its rich culture, Harlem was known to be a place of vice, poverty, and violence. This is reflected in “Sonny’s Blues”—for example, the notoriously poor housing conditions in Harlem led to the construction of many of the housing projects that Baldwin mentions in the story. Harlem was also a destination for jazz performers with its popular and storied venues, such as the Cotton Club, although by the 1950s many jazz venues had migrated downtown, as “Sonny’s Blues” suggests. Many of James Baldwin’s other literary works deal with themes similar to those in “Sonny’s Blues,” particularly his semi-autobiographical novel Go Tell It On the Mountain. Richard Wright, a friend of Baldwin’s, also wrote of the lives of young urban black men in the mid-twentieth century in Black Boy and Native Son, and Ralph Ellison likewise did so in Invisible Man. Other writers who have incorporated meditations on African American music into their work include Ishmael Reed, Langston Hughes, Albert Murray, Jean Toomer, and even Jack Kerouac. Throughout his life, Baldwin frequently cited the importance of Henry James on his writing. James, another American writing abroad, shared Baldwin’s concern with people whose identity was at odds with the predominant culture around them. Preaching Potential. At age 14 Baldwin became a devoted member of a Pentecostal church, eventually becoming a wildly popular Junior Minister. While he lost his faith at 17, he viewed his time in the church as an important step in overcoming some of the difficulties of his personal life, like his abusive stepfather. Much of Baldwin’s work is inflected with Biblical imagery and allusion. Activism and Fame. Baldwin was a nonviolent civil rights activist who wrote prolifically about racism in the United States, and who allied himself with civil rights organizations like the influential Congress on Racial Equality and the Student Nonviolent Coordinating Committee. In 1963, Baldwin was on the cover of Time for his importance in bringing to life the experiences of African Americans living with racism, and his unique ability to illuminate the ideas of civil rights to white and black audiences alike. McNamara, Sylvie. "Sonny’s Blues." LitCharts. LitCharts LLC, 29 Nov 2016. Web. 20 Apr 2019. McNamara, Sylvie. "Sonny’s Blues." LitCharts LLC, November 29, 2016. Retrieved April 20, 2019. https://www.litcharts.com/lit/sonny-s-blues.